Despite getting mixed reviews, The Da Vinci Code made a boatload of money when it hit theaters, with a large portion of the ticket sales coming from overseas, suggesting that the novel by Dan Brown was as big a hit, if not bigger, outside the US as it was within. That’s amazing to me, especially considering how immensely popular the book was here in the grand ole U. S. of A. I mean, how can you get more popular than that? Everyone read it. You couldn’t walk down the street without tripping a copy. It was a cultural phenomenon. (You know you’ve hit it big as an author when people start writing books about your book. And it didn’t stop there either; there were probably books written ABOUT the books written.) The world was Da Vinci crazy. Mr. Brown must have made a fortune to rival that of J. K. Rowling, author of the Harry Potter series. The biggest criticism of the movie was that it was too slow. Not enough action. (We movie goers get fidgety, apparently, if something doesn’t blow up every few minutes or so.) Tom Hanks got his share of criticism of well. His Robert Langdon was too passe, they said, too flat, too uninteresting. And on and on. Oh well, Tom. You can’t win ’em all. As for me, I enjoyed the film. Richie Cunningham from Happy Days (aka director Ron Howard) did a fine job, I thought. 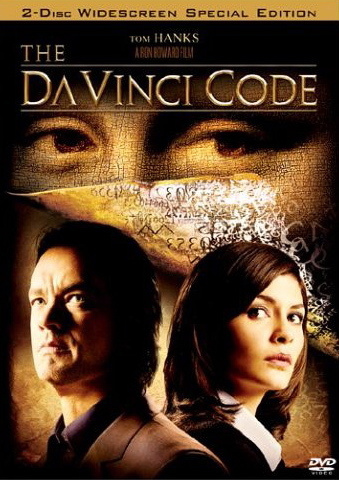 The Da Vinci Code was a difficult book to adapt, and Howard and Akiva Goldsmith, who wrote the screenplay, found a way to present all the historical data and theories of the novel without intruding too heavily on the story line. In other words, it didn’t feel slow to me. History had to be explained. Ideas had to be presented, complex and century old ideas: the Priory of Sion, the theory of the grail, the Templars, the pagan religions which toppled under Christianity, symbols, architecture, and of course Da Vinci himself, a suspected Grand Master of the secret society devoted to protecting the grail. The DVD also included a teaser trailer for Angels and Demons, the novel written by Brown before The Da Vinci Code and featuring the same hero, the Harvard symbologist Robert Langdon. The trailer showed no footage because none has yet been shot. Principle photography is set to begin soon. When it hits theaters, you can bet your bottom dollar this will rake in the money as well. I found Angels and Demons a much more cinematic story. It has the Hollywood “chase pace” that critics thought Code lacked. Tom Hanks is set to star again, but we’ll have to wait until 2008 to see if critics will be any kinder the second time around.